Scrappage deal or no deal? | What Car? Scrappage deal or no deal? Buyers' hopes of bagging cheap scrappage deals have been hit by some manufacturers dumping their cheapest model trims. Vauxhall has dropped its entry-level trim for both the Agila and Corsa, which means the minimum price of each has increased from 8295 to 9245 for the Agila and from 8695 to 10,000 for the Corsa. A Vauxhall spokesman has admitted that, after the scrappage discount was taken into account, both models would have ceased to be profitable. 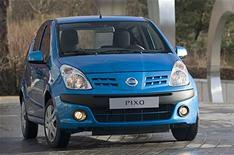 Nissan has also bumped up the price of its new Pixo city car. Pre-launch prices listed the cheapest version the 1.0 Visia at 5995, but Nissan has revised the prices for the whole range and the same model will now cost 6995. Nissan has denied that the price increase is linked to the scrappage scheme, insisting instead that the initial price structure was re-assessed and deemed to be 'unsustainable in the long run'.